Henry is nearly 8 months old and I think we are finally getting the hang of weaning. *KLAXON* He’s now on three meals a day and sometimes can’t get the food in to his gob quick enough! Referencing to my initial feeling of excitement, by the time Henry was 5 months old I had bought a variety of weaning options – baby rice, baby porridge, pouches of fruit and I had already peeled and steamed pears, sweet potato and carrots and portioned them in to ice cube trays for the freezer. I was ready!! But was Henry…??? Peeling, steaming, blending, portioning, freezing! My evidence of the never ending messy logistics of the early stages of weaning! Are they ready? Patience be a virtue! Fellow parents tend to say you know when your baby is ready to wean on to solid foods. I was looking for all the apparent signs for a while – such as watching out for Henry to be interested in what I was eating, seeing if he would put anything and everything in his mouth, sussing if he was hungry for more milk than usual etc – none of these are solely confirmed signs of a baby being hungry for “food”. Babies gnaw on anything when they are teething and in the run up to their 6 month birthday they are exploring and become more curious (or nosy!) and that’s potentially what the “wanting to put everything in their mouths” and “watching what we’re eating” comes from. How did I know Henry was ready? In all truth, I had no idea! And thus I genuinely didn’t know when Henry was ready for solid food. He didn’t enter the world gripping on to a customised “Henry Bevington – How To” manual to gift me with on his arrival! Sometimes I wish he had!! So if you’re a new mummy with a baby of an almost weaning age, please don’t feel rushed or too excited, or pressurised to keep up with others, or even listen to what older generations tell you. The familiar new mother advice quote of “do what you feel is right” stands true when it comes to weaning. When I was a baby the guidelines was 4 months, and some babies are advised to wean early for medical reasons, i.e. severe reflux. Take it each day as it comes, as they say. I did think the guidelines of waiting 6 months seemed a very long time and I had no intention of waiting that long initially. However for Henry I think it was actually about right. 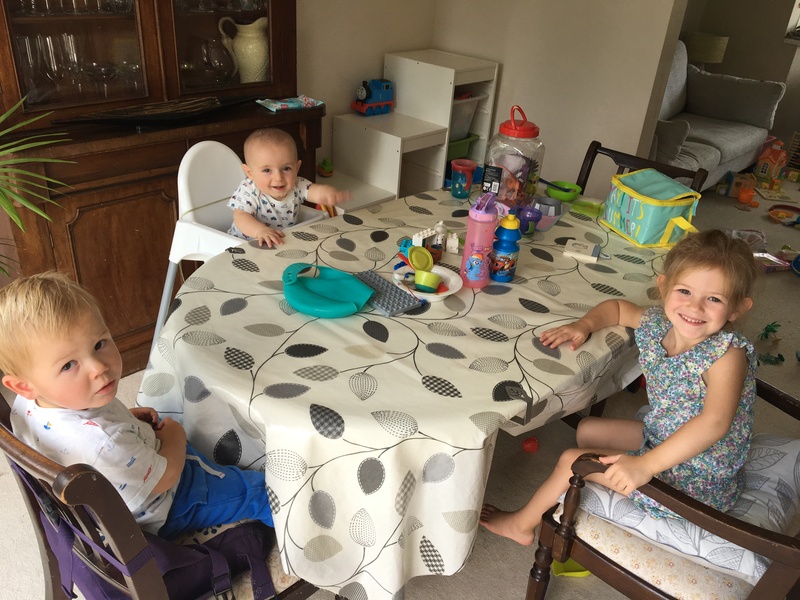 I felt anxious of starting too early – especially when Health Visitors put the fear of God in to you if you dare start weaning early (insert the eye roll emoji) and then I was worried starting too late in case it created a fussy eater. Some of my friends experiences of doing things “by the book” have still found themselves with fussy eating children, so I personally believe it’s in the kid’s DNA and down to them as a person whether they’ll grow to enjoy eating an array of foods and flavours – and not to do with how they have been brought up. But that’s just my opinion! Portions! Organised weaning can be cost effective and time efficient – but is it realistic for a busy mum to keep up this up?! 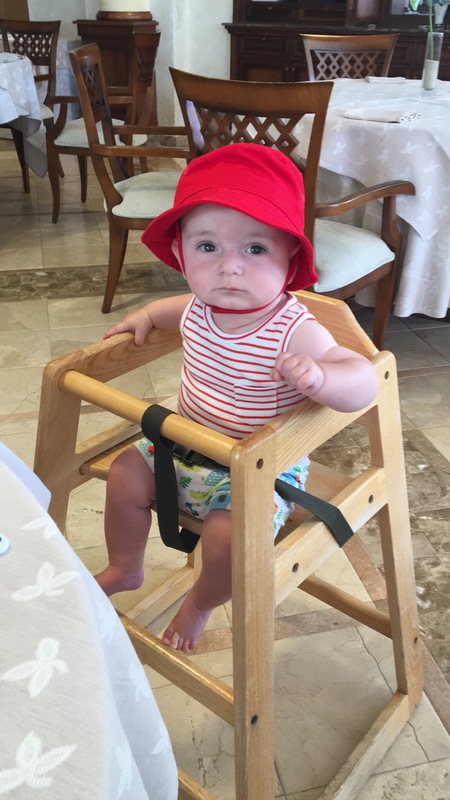 What I have found with my experience of weaning Henry (and with motherhood generally) is that there are a lot of strong opinions out there. I have endured comments from people saying that “baby led weaning” is the ONLY way you should introduce your child to food, that baby rice is pointless (so why would supermarkets sell it??) and that food pouches and jars are the devil (which is total BS). These were all subjects I had to research and where necessary learn for myself. It’s a whole process to digest (excuse the pun!). I tried baby rice for just 2 days on Henry. I didn’t see much point in it, but I learned that myself. As a new parent I believe it’s important to ride your own wave at times and figure things out for yourself. I did attend a local “solid foods” workshop put on by a local council. The lady running the course was a breastfeeding councillor and thus had absolutely no interest in answering questions regarding formula when weaning, almost pretending she didn’t know any answers or useful advice to those not breastfeeding. It made my blood boil and so I lost interest in the session. I think my question was “If my baby is getting hungrier before the recommended 6 month guidelines, should I increase his formula intake or begin the weaning process early?” She refused the answer the question. NOT HELPFUL. I found some midwives, this said breast feeding councillor and a couple of health visitors so scared to talk about formula – it makes me wonder if they get fired or even sent to prison (!!) if they slightly approve/agree with a parent using formula milk!! IGNORE THE FORMULA HATERS! I personally found the Baby & Toddler Meal Planner book from Annabel Karmel useful. Not only does it give you a fairly non-biased approach, but the recipes and food ideas are good but what I find really helpful is the weekly planner to use as a loose guide how many meals a day to introduce and when and to learn how much of his milk to still give him and when to consider reducing it. It’s also time to add drinking water to his diet (which I hadn’t even thought about!). 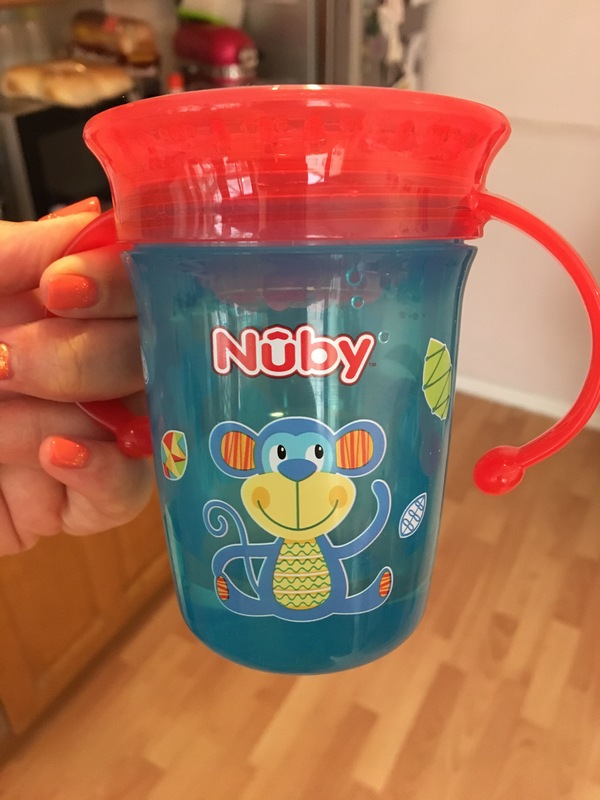 I love his Nuby cup… the chewing action on the rim lets out a bit of water and it’s a no spill cup! Don’t forget the water! The 360 cup by Nuby is a great beaker choice. 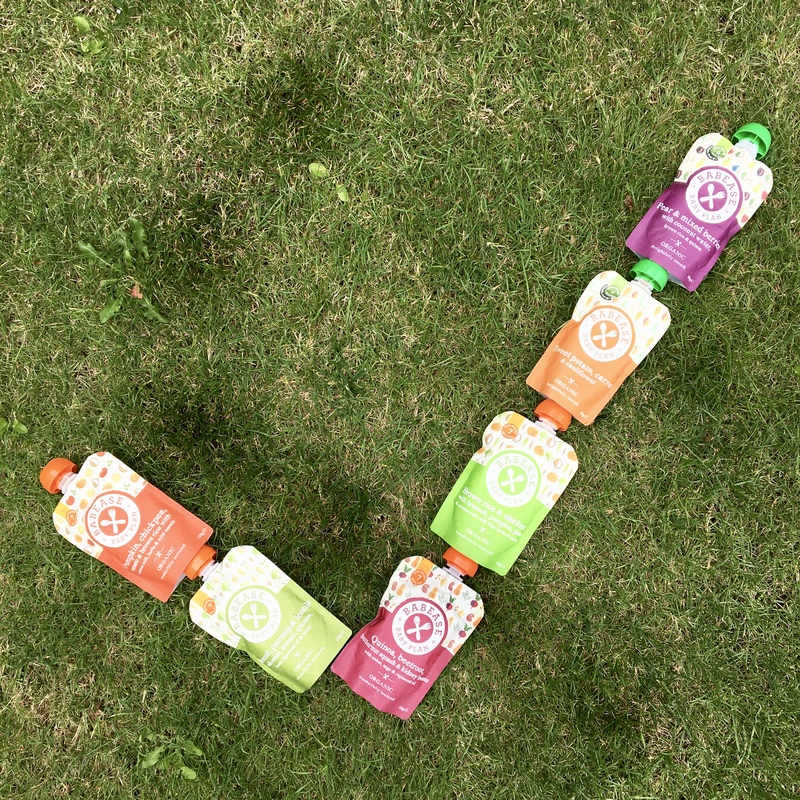 We started weaning at 5.5 months, but literally introducing the tiniest amounts of foods. A teaspoon, if that, of pureed fruit or around lunchtime for about a week. After a week I introduced vegetables and a slightly bigger portion, and moved away from purees to lumpy mashed up servings. I don’t think Henry was on two meals a day until after his 6 month birthday. 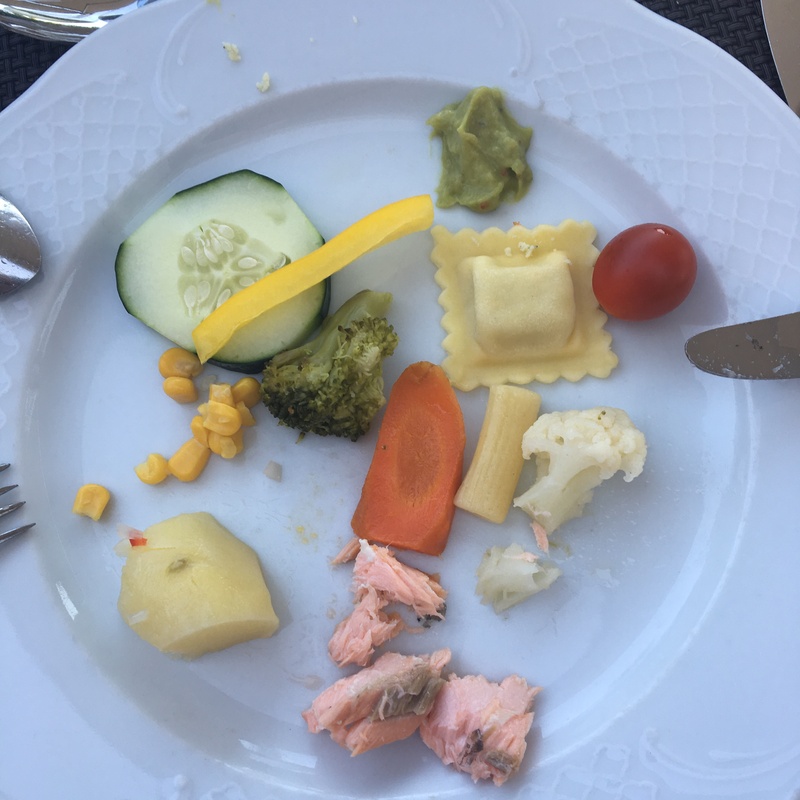 We went on holiday when he was 6.5 months old and the buffet restaurant was a blessing for him to try new flavours and textures. 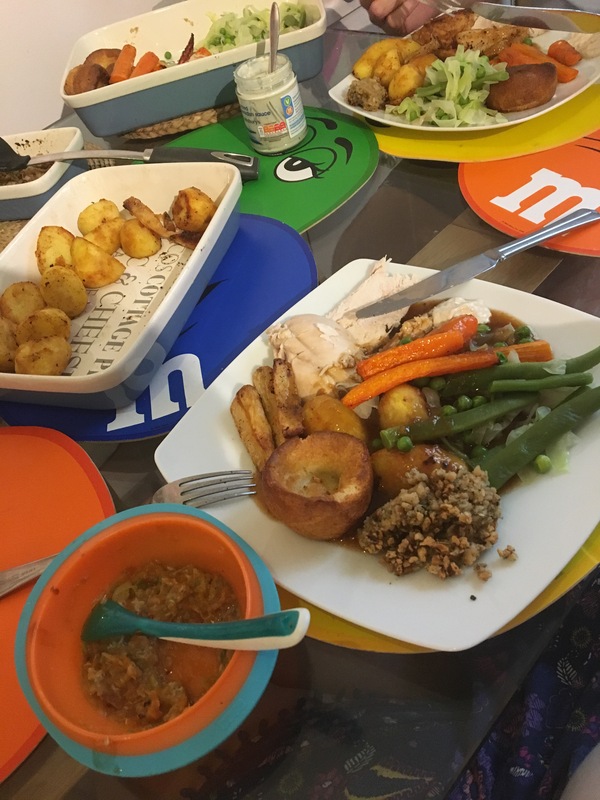 It gave him the option of letting him hold different foods and to make a mess – without me having to do any of the preparation or clearing up was a holiday in itself! 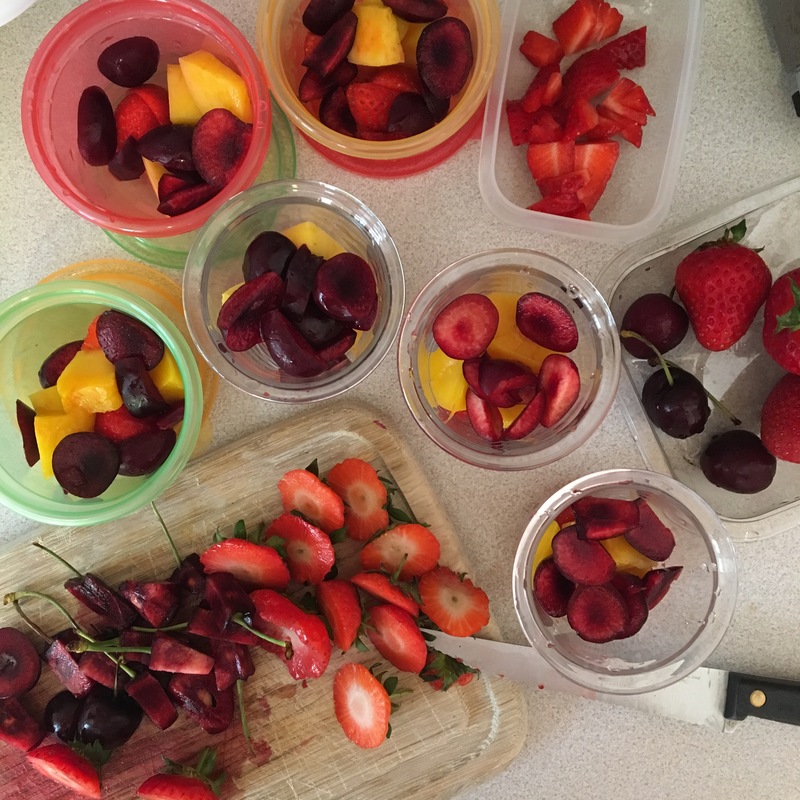 Ready to make a baby led weaning mess on our summer holiday! We were on three meals a day by the time he was 7 months old, and a friend of mine advised me that her GP has suggested sticking to a portion size of a Cadbury’s creme egg (when condensed), which I thought was a really good piece of advice for the early days (Henry can easily eat a bit more now but I try to use that as a guide). I found that Henry was having less milk quite early on in to the weaning process and I think that may have been down to his portions being too big, so I quickly adjusted that. Every baby is different and therefore every appetite varies, without forgetting that milk is still a very important part of their diet for a long time yet. Baby led didn’t work for us in the beginning. Henry wasn’t hugely interested in picking things up and putting them in his mouth – including toys, teethers etc – and to be frank I didn’t help matters by being scared of the smallest piece of food potentially choking him. However NOW he does now like to pick up finger food (as well as toys, teethers, the remote control – everything!|), at just shy of 8 months. We have a developed a happy medium – a mix of mashed up food as well as finger food. Baby led is hard work and not always successful. On our holiday it did give Henry the opportunity to try different flavours and textures and to interact with food. For breakfast Henry loves half a weetabix with whole milk (cow’s milk) with some kind of fruit (usually half an inch of chopped banana, 1 strawberry or a teaspoon of poached pear) and he also loves Ella’s Kitchen Strawberry & Raspberry porridge mixed with either hot water or with some of his formula milk – warmed up in the microwave for just 15 seconds. For lunch and dinner we naturally started with various fruits and vegetable combinations, but I do now try a bit of baby led (or certainly largish bite sized pieces) and usually at lunchtime when I tend to have more time for Henry to explore the food – this is because we have usually just got back from a baby group, so he’ll have his lunch in his own time before his long afternoon nap. My mucky pup enjoying his grub! I’ve also slowly introduced a variety of flavours such as Meridian’s smooth peanut butter (Henry loves this topped on chunks of banana), diced cherry tomatoes, avocado pieces, peeled sticks of cucumber, small pieces of Organix rice cakes, Dairylea on bite size pieces of wholemeal bread. In terms of meat and fish Henry LOVES prawns, small pieces of mackerel (remember to check for bones! ), salmon, chicken and pork. I make sure chicken and pork are served in tiny pieces as he’s not the professional chewer just yet! For dinner we tend to do a more mashed up meal with a spoon. This is partly because I want to allow for a good sized gap between dinner and his bed time bottle, as I find if he is too full at bedtime he won’t have much of his last milk feed – and not only is the milk intake vital at this age still, but he’ll end up waking in the night hungry! 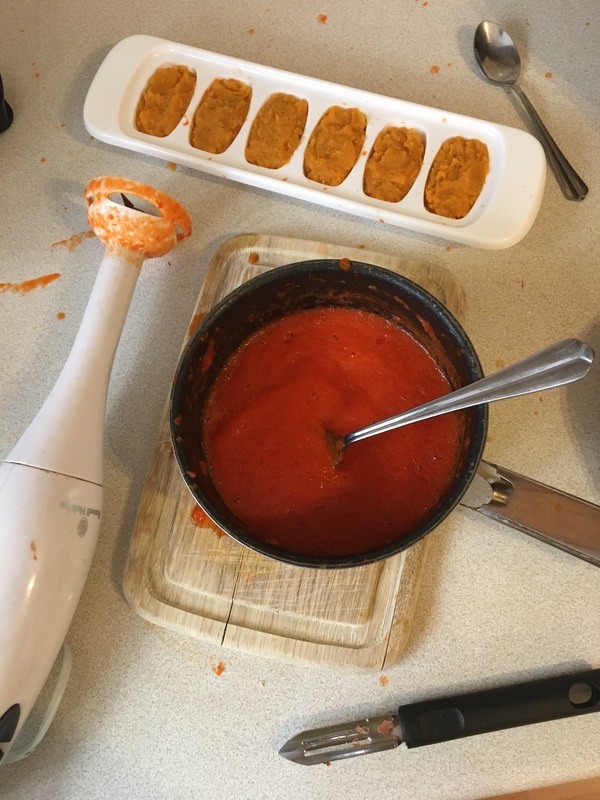 His baby led weaning lunches can take as long as an hour!! If I’m running behind, I sometimes give him a little finger snack whilst I’m preparing his meal. His favourite snacks at the moment are Ella’s Kitchen Tomato & Basil Melty Sticks – he demolishes them and savours every crumb – I never find any leftovers on the floor or his lap. For dessert we often have small pieces of grapes, mango or melon or a Little Yeo yoghurt from Yeo Valley, which Henry LOVES. I love Henry’s little lunch and dinner play dates! Out and about or in a rush? I love taking Henry out for lunch with his little buddies. Some restaurants, such as Giraffe, offer free kids meals during school holidays – what a great initiative to get kids trying new foods and if there is more than one baby at the meal then why not let the kiddies share plates to explore their tastes even further! 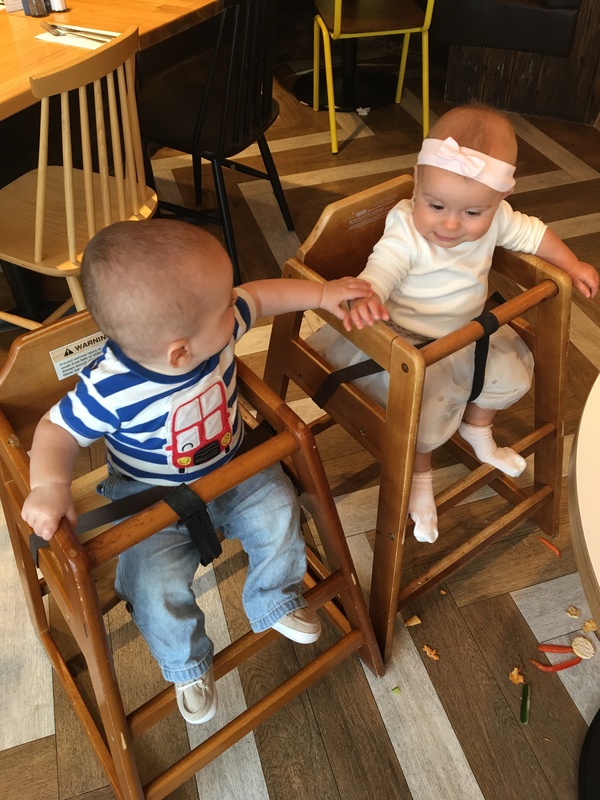 Henry on a lunch date with his friend Lucia! All parents need a ready made meal for their little ones occasionally. There are lots of great natural and organic choices on the market which I personally feel safe feeding to Henry. Some (brands I won’t mention) don’t seem to contain the same level of goodness, nutrition and quality as others, so it is worth reading the labels and be sure to know what you’re feeding your child if you don’t make it yourself. 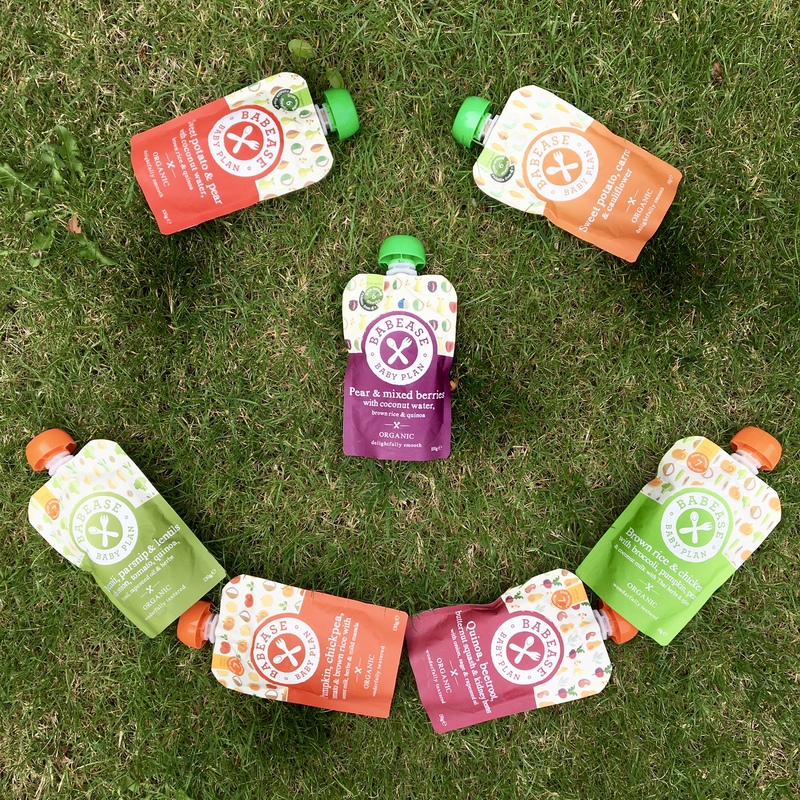 Pouches are lightweight and great to pack for holidays in case you don’t have cooking facilities, or for the simple fact that you are on holiday too and it’s okay to have a break from peeling, boiling, mashing, portioning, freezing etc! So long as you try and go for pouches with a good reputation and a well balanced nutritional content. I’ve joined the guilty club whereby I have forgotten to pack a spoon when feeding Henry a pouch for lunch on the go! 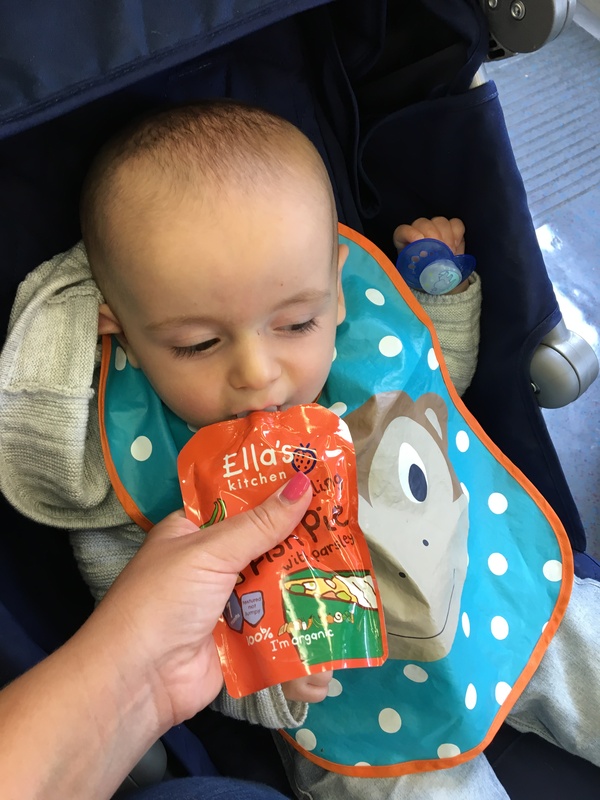 Ella’s Kitchen are of course excelling in the market in terms of food for babies. I found their single flavour pouches a blessing in the beginning, i.e. pear, apple, banana etc – adding a teaspoon or two to Henry’s porridge or even just giving this on it’s own in the very early days. Their pouches are freezable too, so if you only use half a pouch of a main meal or a tablespoon of peas, for example, you can portion the rest in to ice cube trays for the freezer and save for another day. 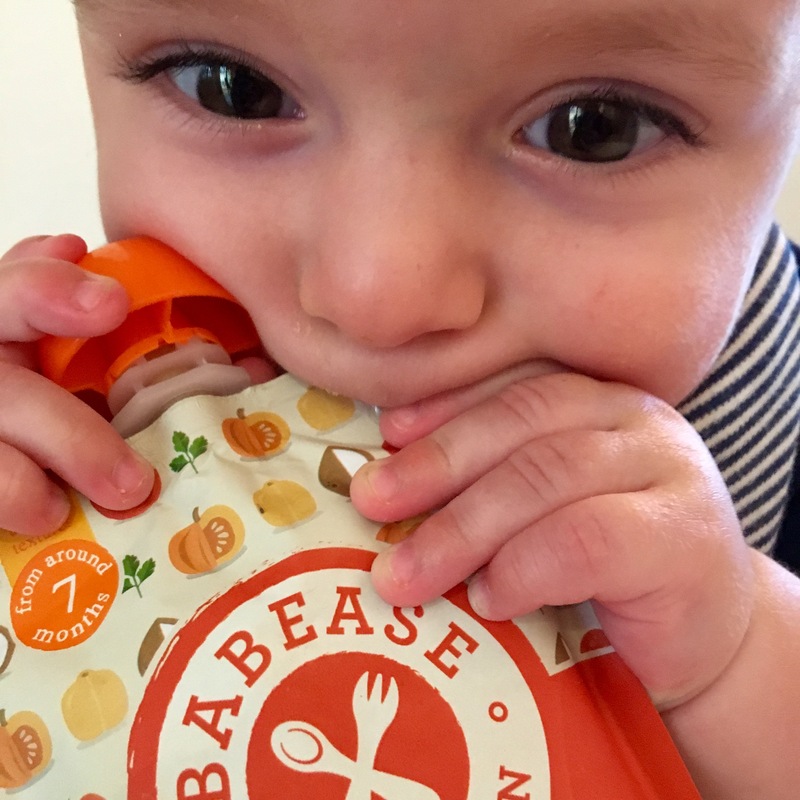 Henry was recently sent some pouches from Babease to try. Organic and predominately vegetable led, their meals for babies don’t contain fruit fillers (which can cause the risk of developing a “sweet tooth”). In their stage 2 pouches there are no fruits at all which is refreshing in the baby food market. 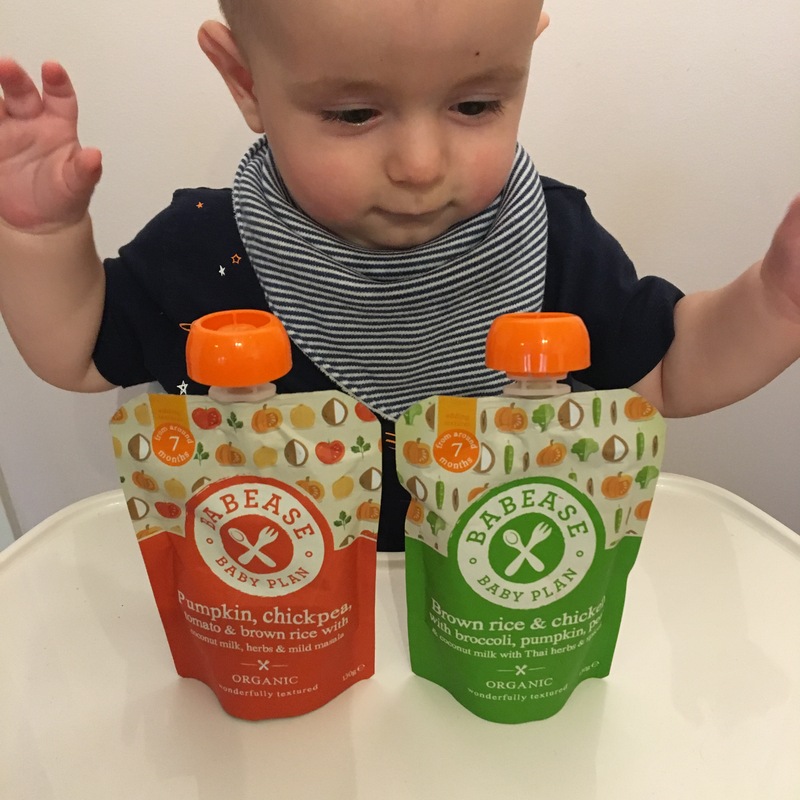 From the Babease range of recipes, Henry’s favourites so far from Stage 1 are definitely Pumpkin & Pea and Pear & Mixed Berries with Coconut Water, Brown Rice and Quinoa. From the Stage 2 he loves Quinoa, Beetroot, Butternut Squash & Kidney Beans With Onion, Sage & Rapeseed Oil and Pumpkin, Chickpea, Tomato & Brown Rice With Coconut Milk, Herbs & Mild Masala. 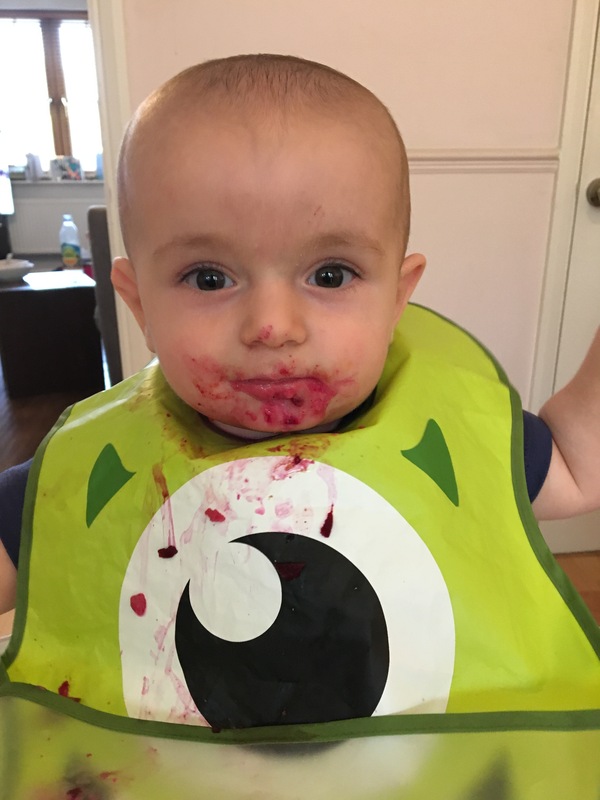 So this is my weaning experience so far. We are 2.5 months in and I am happy-ish with how it’s going and feeling more confident than I did. 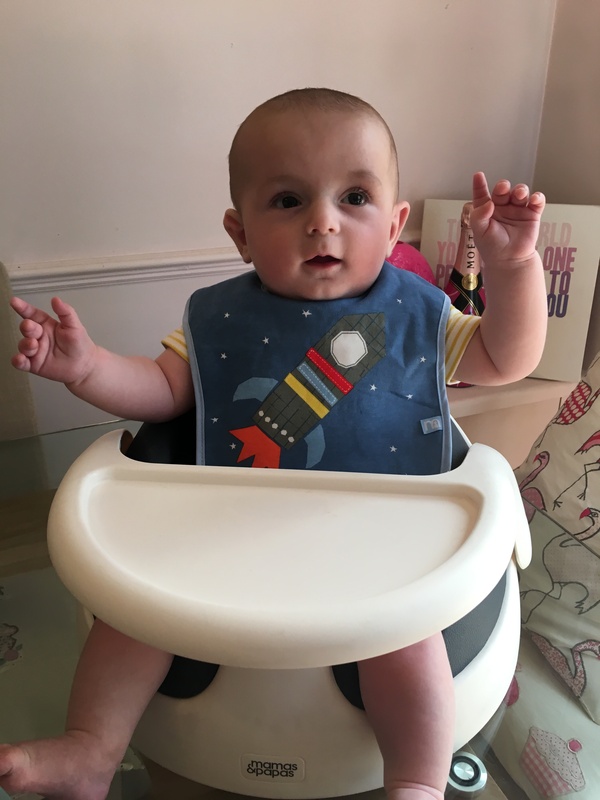 Weaning can be quite a daunting experience – not forgetting the risks of choking, checking that food isn’t too hot, portion control and teaching babies to drink water from a beaker is a task in itself! Henry’s milk intake is still high and I’ve slowly managed to get his meal portions proportioned correctly to still allow for the guided 500ml daily allowance of milk. There are certain foods he’s not a huge fan of yet – for example he’s finds eggs, pasta and some flavourless vegetables such as broccoli and cauliflower an effort! I’m on the look out for inspiration when it comes to feeding Henry. I want to discover exciting meals and recipes. 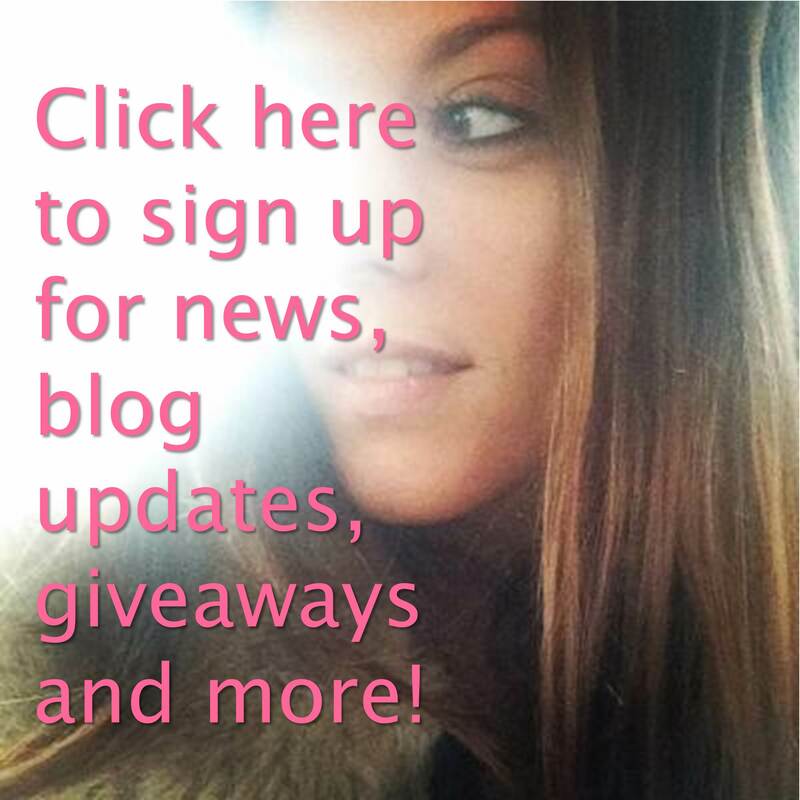 If you know of any great bloggers to follow or books to buy please let me know! 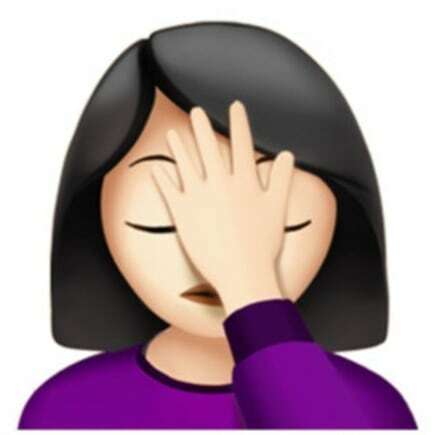 And are there any useful gadgets I should be using to avoid using every saucepan and utensil I own!? I also want to learn of meals, especially lunch time meals, that both me and Henry can enjoy together. I often don’t eat lunch until 3pm by the time I’ve prepared his, fed it to him, put him down for a nap, cleared up and then made myself a lame cheese spread sandwich! I like Henry to be having what we’re having – even a roast dinner! If you have ANY advice, and I’m all ears to everyone – whether it’s recipes, snacks, time saving efforts and any general guidance I’d really appreciate it! We mummies are all in this together after all.